Before I officially began my baseball blog, I thought about some topics to write about. One of my initial ideas was to discuss my favorite (and least favorite) card sets, based largely on design elements. Soon after launching my blog I discovered that other collectors had already done a better job of discussing card set designs than I could have, so I scrapped that plan. 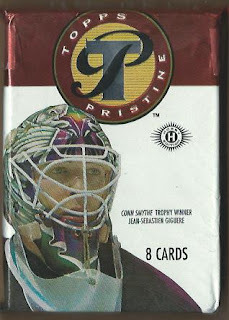 More recently, I considered making a Top Ten list of my favorite card sets. 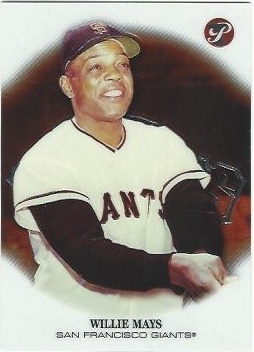 That's been done before, too, and too often Topps or Upper Deck used the same design in the same year across multiple sports. 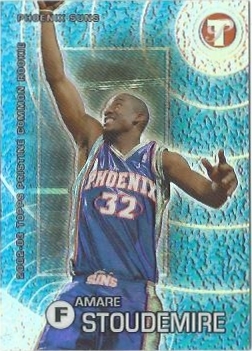 Topps produced Pristine basketball cards from 2001-02 to 2005-06. 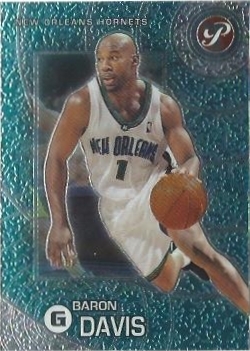 I wasn't interested in the NBA at the time and did not know that the first/last Pristine sets were basketball cards until researching this post. The only place I knew that sold packs of Pristine was a little hole-in-the-wall card shop tucked inside a corner of the Connecticut Post Mall. Their selection of singles was weak, but they had a wide variety of higher-end products. 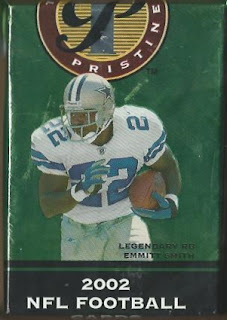 That's where I got hooked on the joy of ripping a pack-within-a-pack-within-a-pack. 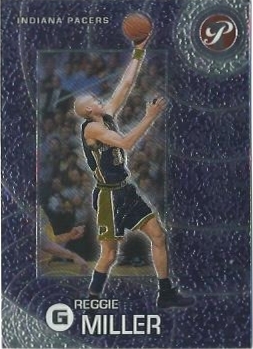 Each Pristine pack contained 5 or 6 cards and another pack - which contained a relic (and possibly another card?) 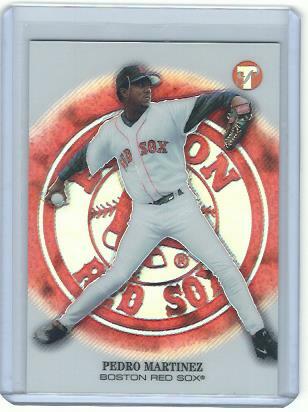 along with another pack - which contained an uncirculated card. Here's a look at the base design. 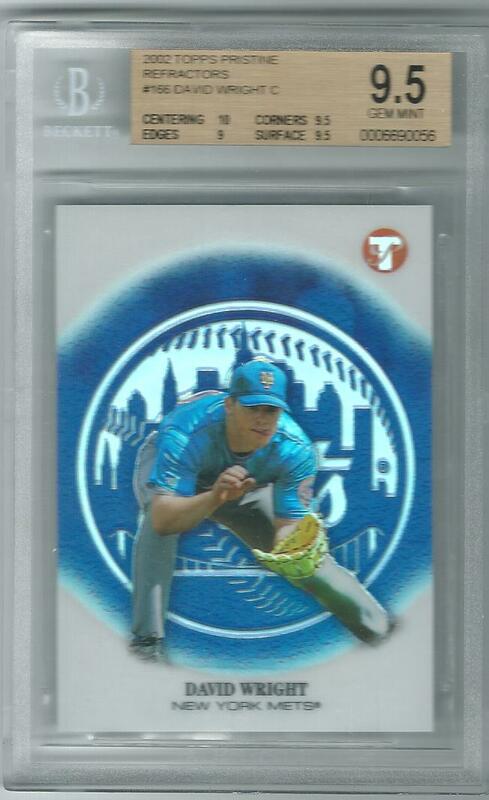 I've always been drawn to cards with big logos, and Topps does a great job with these. The logos are clearly visible without being intrusive. 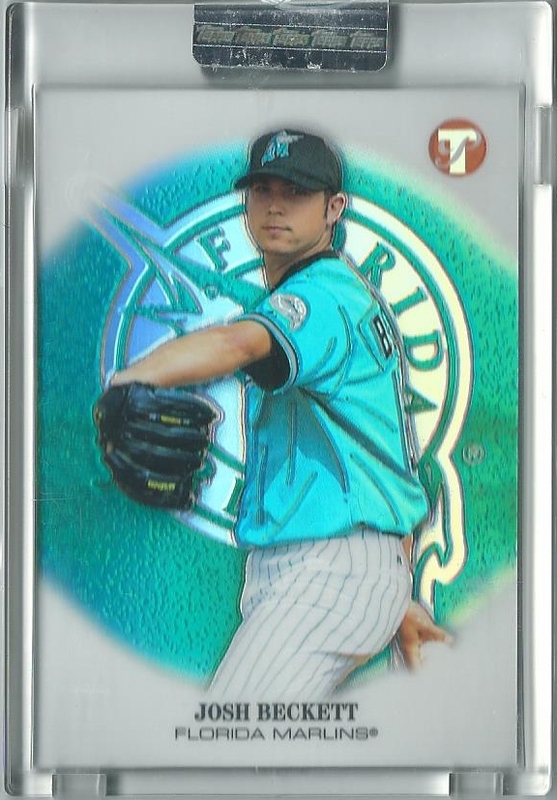 Refractor parallels (#d/349) really bring out the team colors. 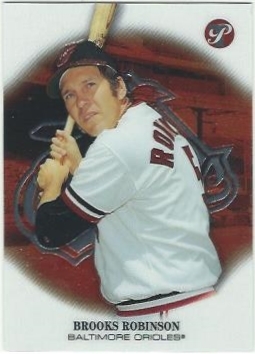 I'm not a big fan of the perforated edges on these Gold Refractors (#d/79), nor am I that thrilled with the checklist. 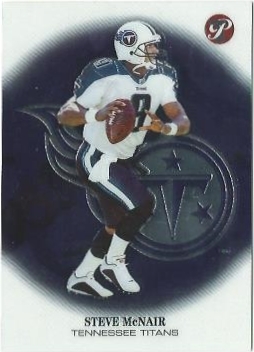 There are only 50 veteran players in 2002 Topps Pristine football. The remaining 120 cards are three tiers of 40 different rookies including Julius Peppers, Clinton Portis, and.. Eric Crouch. 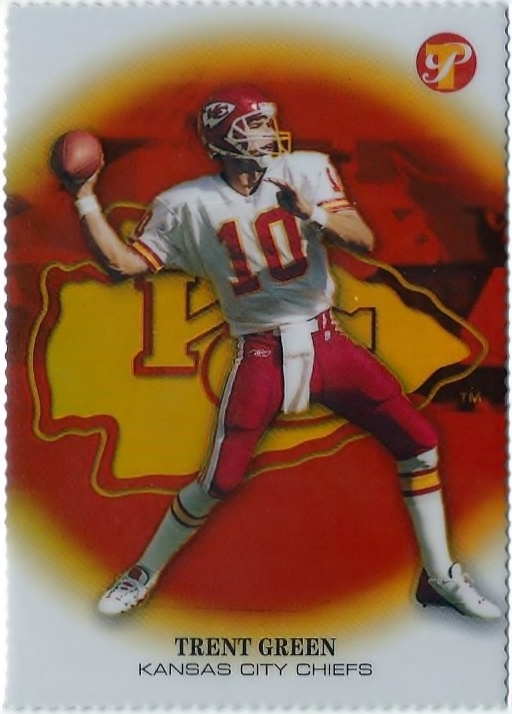 During the past COMC sale(s) I was shocked that base cards of Jerry Rice and Brett Favre were available for about 60 cents each. I nearly bought the Brett even though I already have one (ended up buying McNair and Smith instead.) 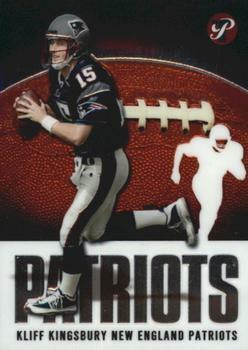 Since I have Favre cards from three consecutive years of Topps Pristine, here's a side-by-side comparison. Which design is your favorite? I bought at least one pack of 2003 Pristine football. Pulled a Brian St. Pierre RC and cursed myself for wasting my money. I also had a Kliff Kingsbury kard at some point. 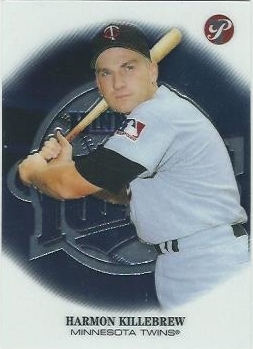 I'm not sure if I bought any packs of 2002 Topps Pristine baseball. 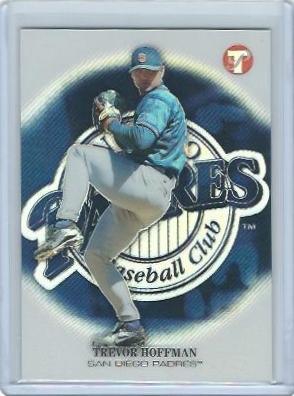 My interest in baseball was lukewarm at the time - the Yankees were still ruling over MLB with an iron fist - and my card collecting interests were heavily weighted towards hockey and football. But in the years that followed I often added any singles I could find to my Beckett marketplace orders. 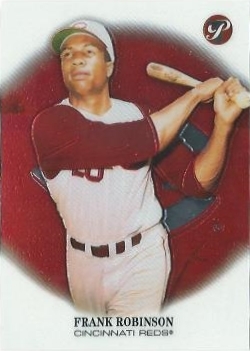 ...while cards #141-150 feature baseball legends like Mays, Musial, Yaz, and more. I'm only missing three of the ten legends in the set (Nolan Ryan, Mike Schmidt, and Reggie Jackson.) 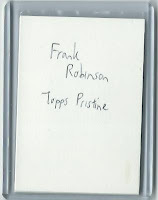 A Frank Robinson card arrived in my last COMC order - but it's heavily curled. This was very strange to me. 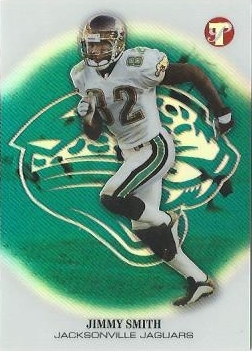 I've had dozens of Pristine cards in my collection. They all bend a tiny bit but not as severe as this Robinson. I stuck it between two decoy cards inside a thick top loader. That'll straight'n 'im out. 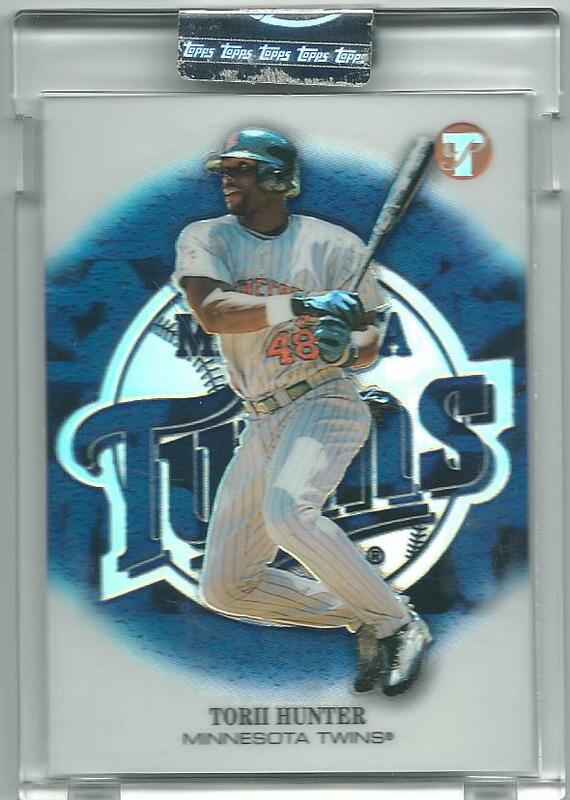 I had these cards on my want list for years, and I insisted on the refractor parallels of the base "common" tier. (What can I say? I'm a sucker for bold, shiny team logos.) Both cards were stubbornly priced at $100+ until about 2010. I waited for the market to cool on these and picked up the Wright for $32 in 2012. The Mauer cost me $29 a year later. These rookies aren't nearly as valuable to the collecting world as they are to me. 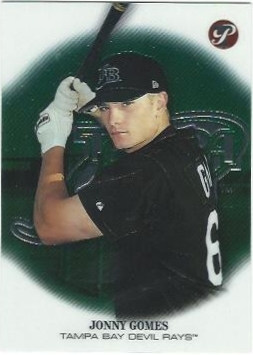 Jonny Gomes was a key contributor to Boston's 2013 World Series title. 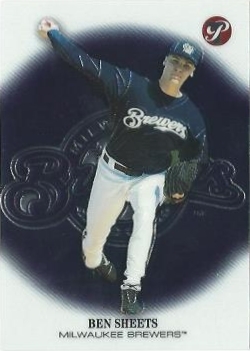 Earl Snyder was a beast in triple-A Pawtucket, but the Connecticut native couldn't stick it in the show. 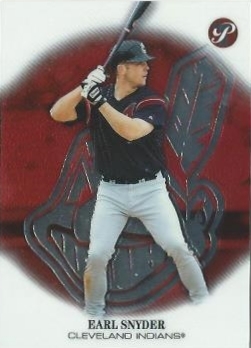 Before I unseal the uncirculated cards I have a few "free-range" refractors to show you. 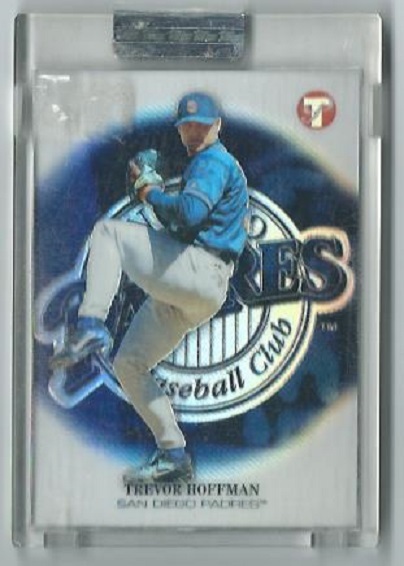 All three of these are serial numbered to 149, including the Trevor Hoffman..which I cracked open in a prior post. 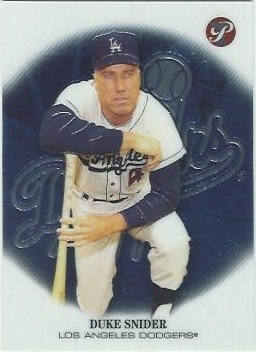 These are also serial numbered to 149 - including the same Hoffman from before. 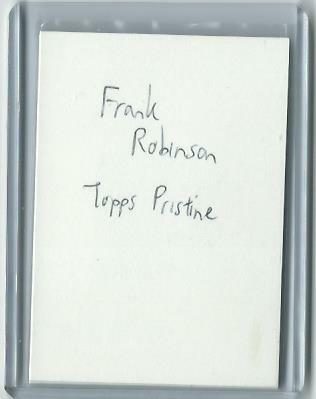 Which begs the question: are all the refractors initially uncirculated, and any singles found in the wild were broken out somewhere along the way? 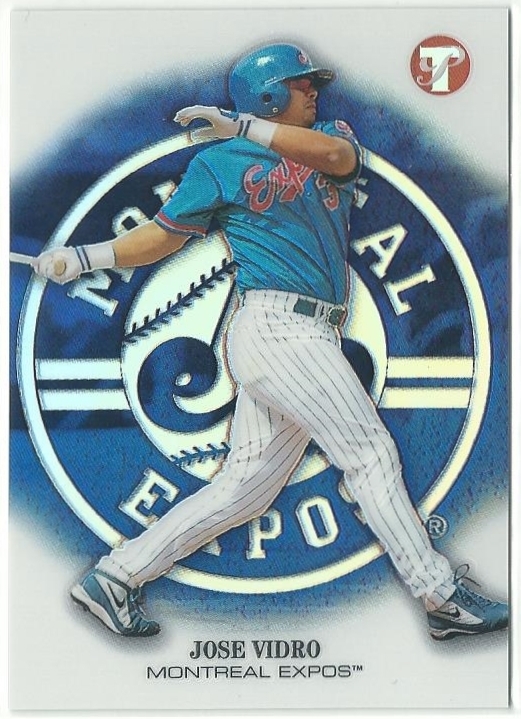 Or did Topps produce 149 sets of uncirculated refractors and 149 sets of circulated refractors? TCDB appears to indicate the former is more true than the latter. Now let's see what's been hiding underneath those old wrappers damn, these packs were $30?!? How was I able to afford so many? Oh..right..no wife/kids/mortgage in my early 20s. 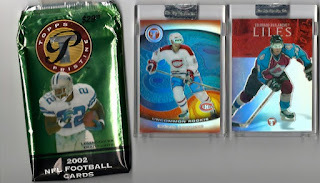 More hockey rookies in pack two - Matt Stajan and Jordin Tootoo. 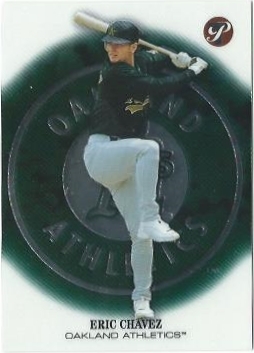 I thought there might have been a baseball card in one of the packs. Sorry if I oversold the surprise. Wow - nice overall - but the Stajan at the end, really pops nicely with the colour. Very Maple Leafy too! You're right, it was a very interesting brand back in the day across all sports. Any excuse for another Refractor is usually just fine in my book! 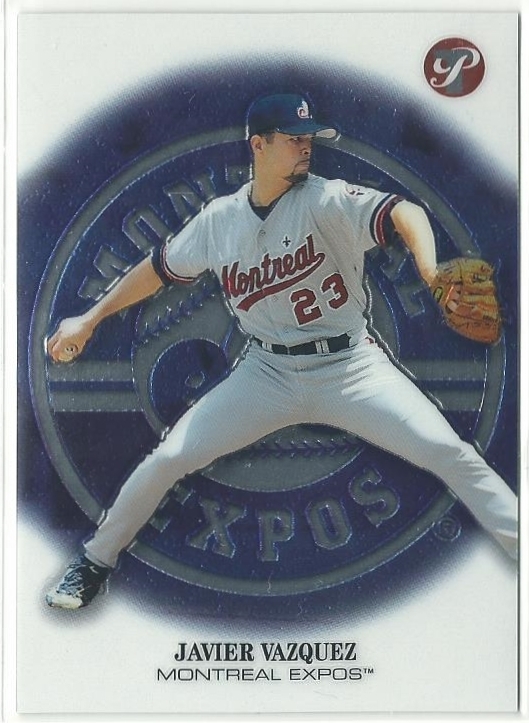 Pristine has always look nice (those refractors, wow!). But legends on very modern designs have never looked right to me. I didn't even know these were a thing until about two years ago when I found one at a card show - I now own a whopping three of them. My only problem with these sets, and it's probably just a "me thing", is that I always get them confused with the eTopps cards, especially when their still in their uncirculated cases. 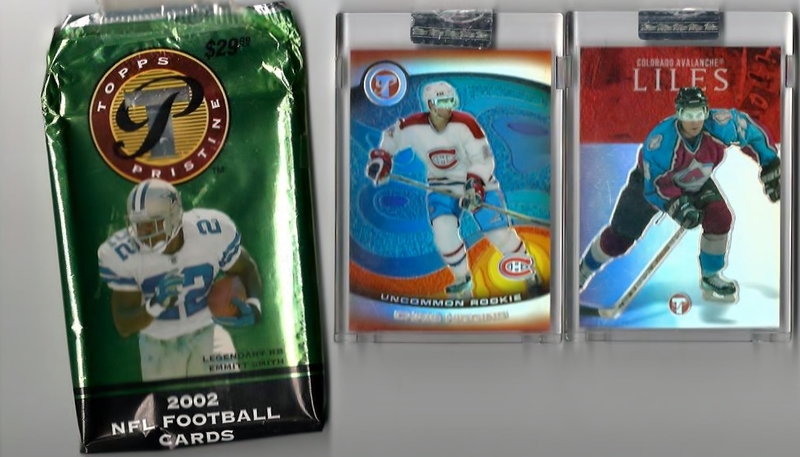 I was out of the hobby when these were released, so I never opened any... or if I did, I don't recall opening this stuff. I do have some Pristine singles I've picked up over the years. The refractors are really attractive. 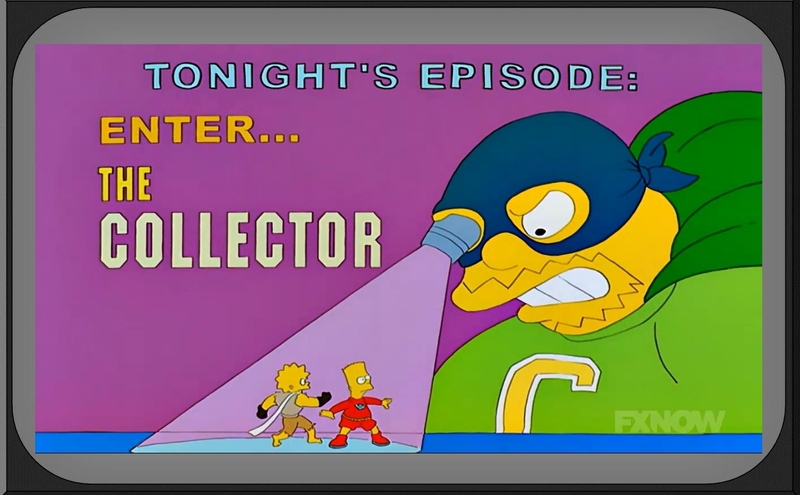 Those two hockey refractors at the bottom of your post remind me of Select Certified Mirror Blue parallels from the mid 90's. I'm not familiar with Pristine so this is a great introduction. I do like the large logos on these. I'll have to go looking for some. Good post. 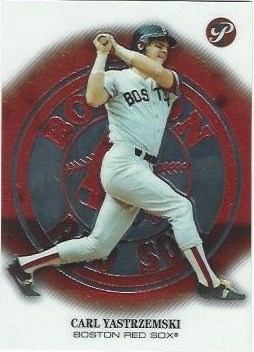 I have the same Yastrzemski card from pristine that I got for a couple bucks at a card show. Otherwise, I'm quite unfamiliar with the set.